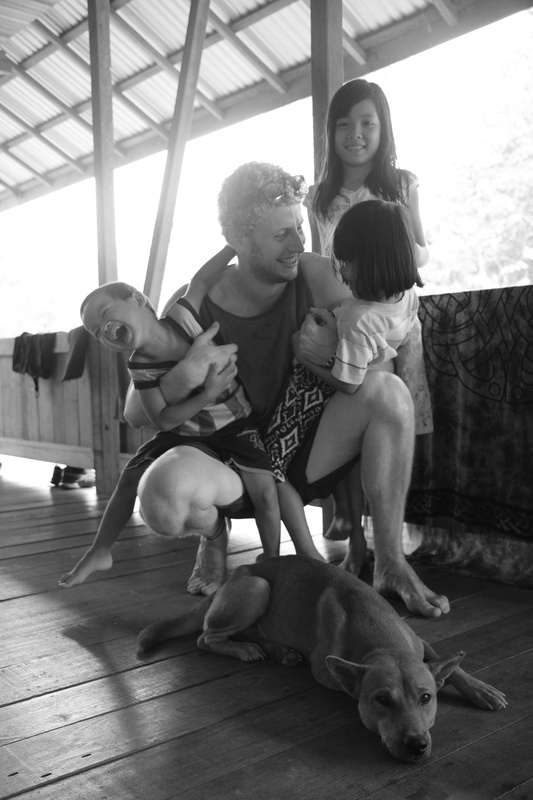 It’s hard to believe that three years have passed since I first spent time living amongst the indigenous Dayak communities of remote West Kalimantan, Borneo. 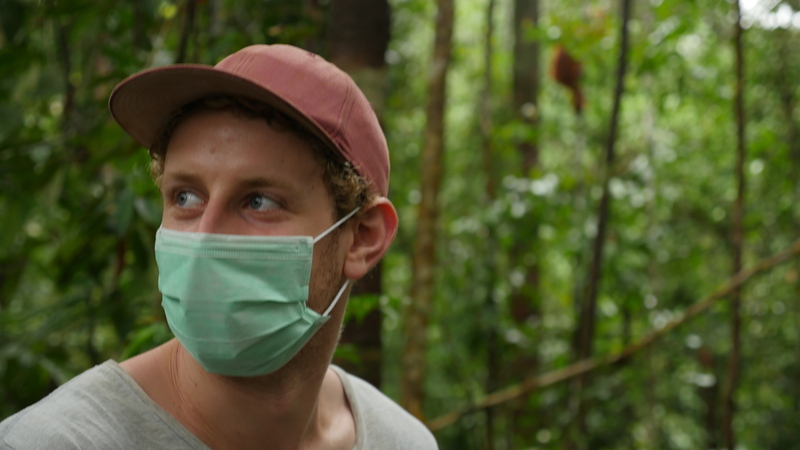 Since then, the project I was involved with which was the subject of the 2014 film Rise of the Eco Warriors, has progressed in leaps and bounds and continues to shine as a beacon of hope for the future of the forests and wildlife of Indonesia. In October 2014 a small group of our original team, along with some new supporters, returned and spent three weeks assessing first-hand the ongoing progress being made by the local people. Since my last trip to Borneo in March 2013, 11 more orangutans have been rescued and brought to the rehabilitation facility in Sintang to begin the long, slow journey back to a life living free in the forest. A total of 14 orangutans now reside at the Sintang Orangutan Centre which has undergone some amazing developments in the past 18 months. A large two story wildlife clinic has now been completed on the premises. New and improved quarantine enclosures have been built, where any new orangutans must spend a period of time before being introduced to the main facility with the other orangutans. A food and enrichment preparation building has been constructed, as well as a new perimeter fence and security system around the centre. An administration office and education building are now also in full operation. The centre employs two veterinarians together with a passionate and dedicated team of local orangutan carers and wildlife technicians to carry out the day to day operations. The orangutans are cared for around the clock, with keepers being on site and on call 24/7. It was very touching to see both the genuine love and care that the men and women showed towards the orangutans and their obvious pride in the project and what they are achieving. About four hours’ drive from Sintang, through a desolate palm oil plantation, lies the village of Tembak. It’s hard to put into words the feelings you experience as you drive into Tembak, but I can honestly say it feels like coming home. This is a place like no other. For more than 20 years now, the villagers have defended their forests from palm oil companies and created what can only be described as an environmental oasis. The people of Tembak live totally at one with nature and from this perspective I believe are amongst the richest individuals on our planet. The children laugh and play from sunrise to sunset. The air is cool, fresh and clean, the streams flow with crystal clear drinking water and the rainforest stands tall. Our friends in Tembak could not have been more excited to show us everything they have achieved since our last visit. Back in 2012, I was part of a small team who worked alongside Dr Willie Smits and the local people, to begin the planning and construction of an orangutan forest school facility in Tembak. The villagers donated 58 hectares (143 acres) of protected virgin rainforest to be used as a training forest for orangutans that were destined for a life back in the wild. Since our small initial contribution I was absolutely thrilled to see five orangutans now playing and climbing in the forest, including baby Jojo, the first orangutan we helped to rescue. 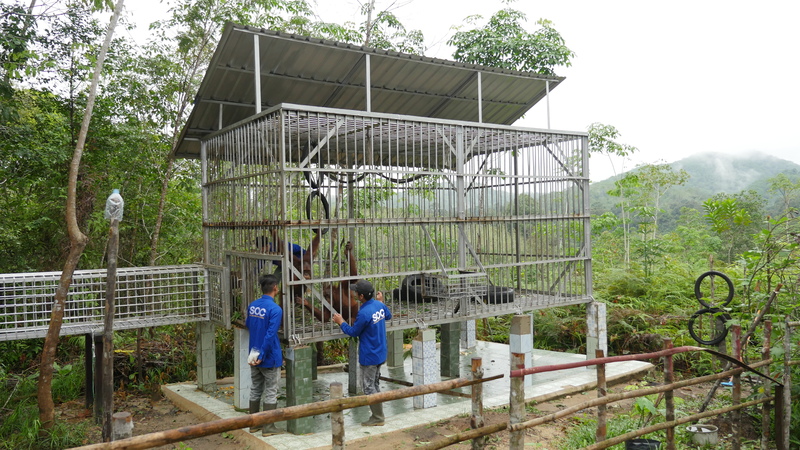 A field clinic has been constructed using funds that our group were able to raise and a very large ‘sleeping cage’ has also been completed and is now used by the orangutans at night, after their long days spent in the jungle. 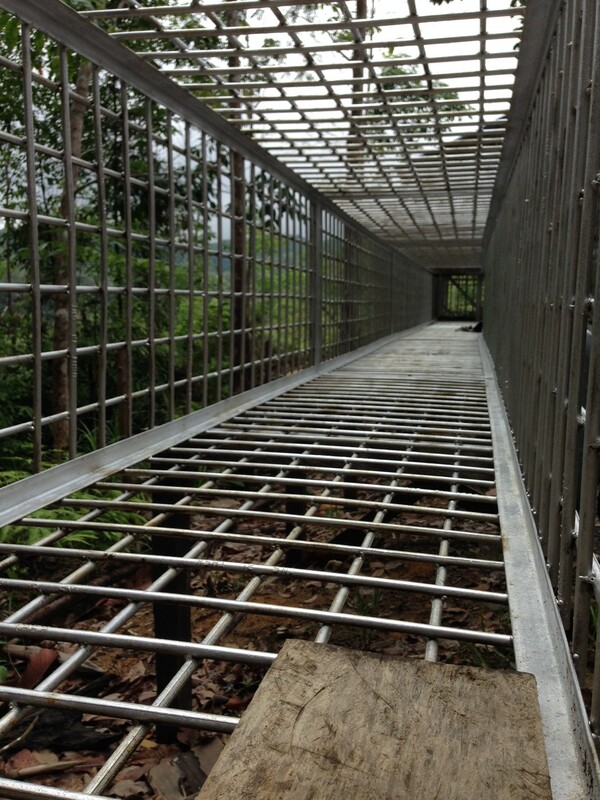 The sleeping cage has a long tunnel attached which acts as a corridor to the forest, so that human contact can be kept to an absolute minimum during this final stage of rehabilitation before release. An orangutan (and human) proof electrified fence, powered by hydroelectricity and solar energy is in the final stages of completion. 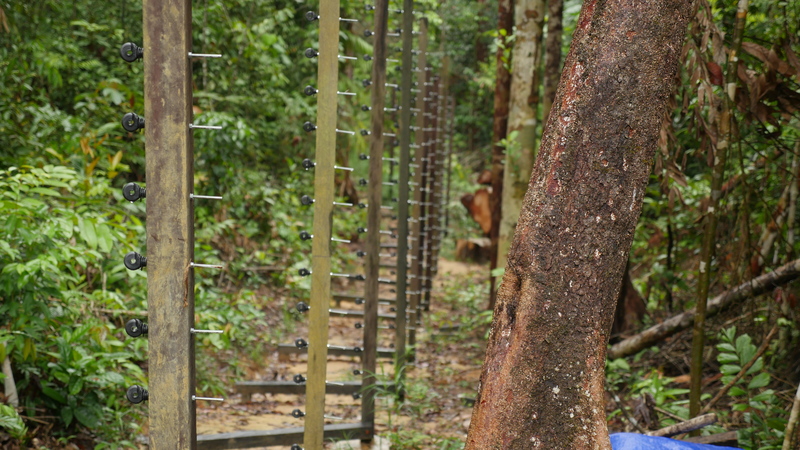 This fence encloses an area of two hectares (4.9 acres) of rainforest to allow the orangutans to roam freely and safely during the day in forest school. 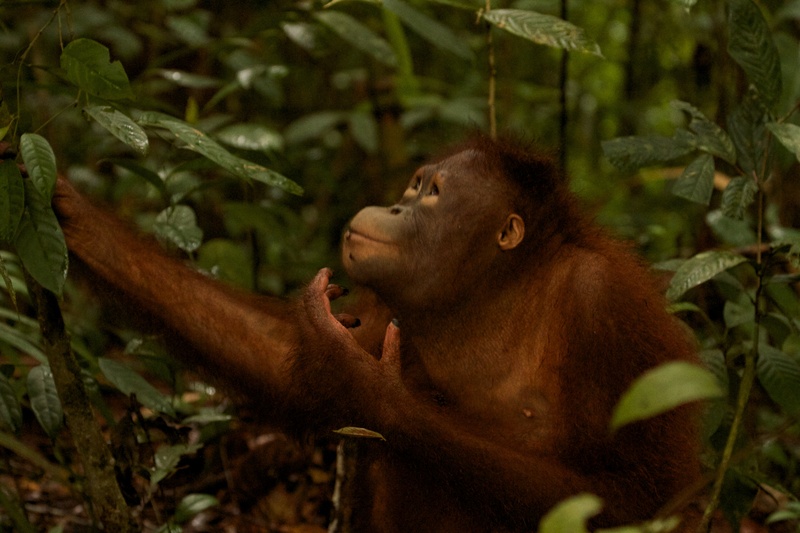 Some of the orangutans, including Jojo, are now competent ‘nest builders’ and even sometimes choose to spend the night in the forest, rather than coming back to the sleeping enclosure. 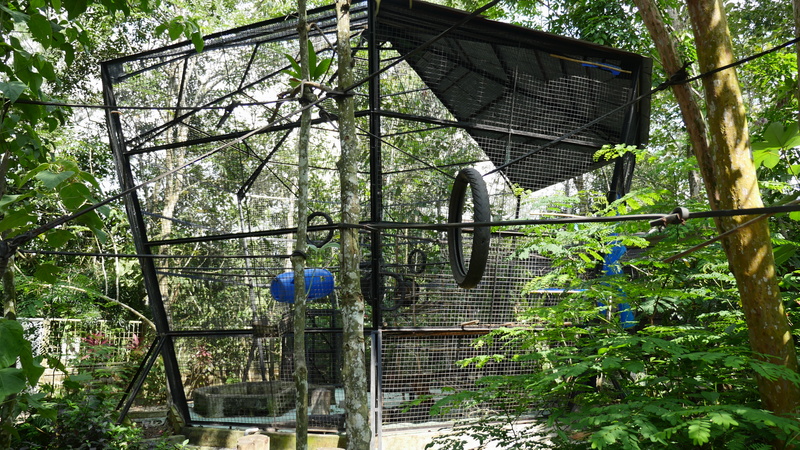 One two hectare enclosure is large enough for five orangutans to undergo forest school, however, with another 14 orangutans at the Sintang Orangutan Centre and many of those ready to begin forest school, more enclosures are desperately needed. 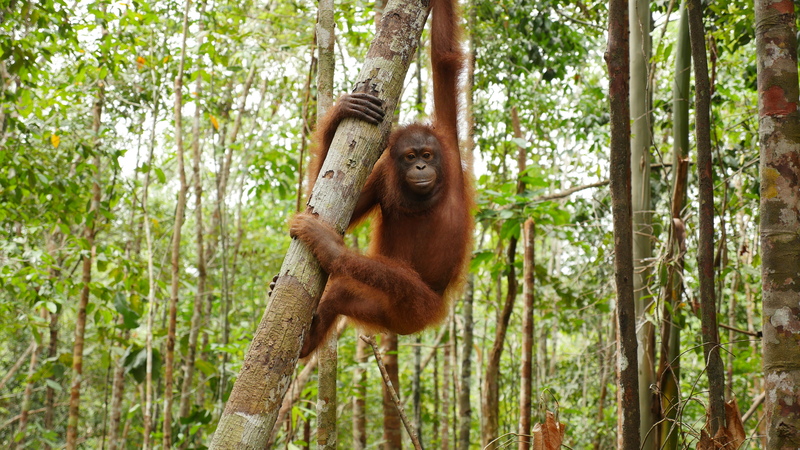 This project is truly unique because orangutans undergoing rehabilitation are able to roam freely in the rainforest, whilst still being supervised and cared for around the clock by experienced carers. 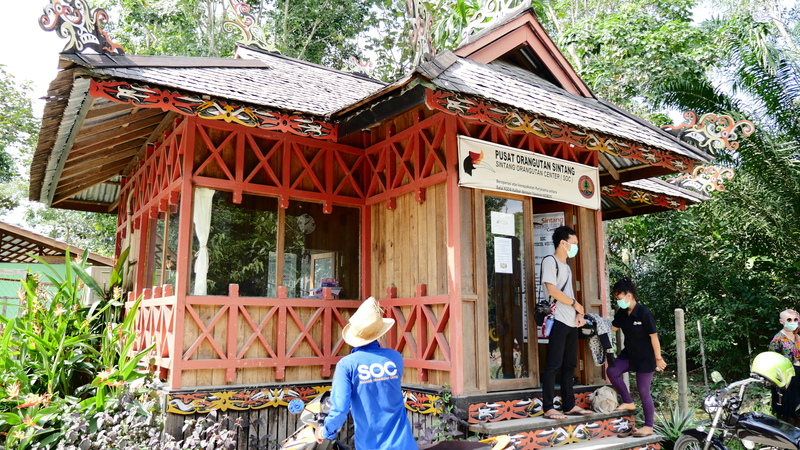 One of our immediate goals is to raise the funds to pay for the construction of both another large sleeping enclosure at Tembak and another two hectare forest school enclosure, as soon as possible. Perhaps the most heartwarming news from this trip was the fact that three orangutans, including Jojo, who is now almost seven years old, will be ready for release early in 2015. What’s even more exciting is that only a few hours drive from Tembak is an enormous 30,000 hectare (74,000 acres) area of untouched rainforest that will be used as a permanent release site. Only two weeks before our arrival a large meeting was held in Tembak, with over 100 village leaders coming together to formalise an agreement to ensure the long term protection of this rainforest from the exploitation of logging and palm oil companies. 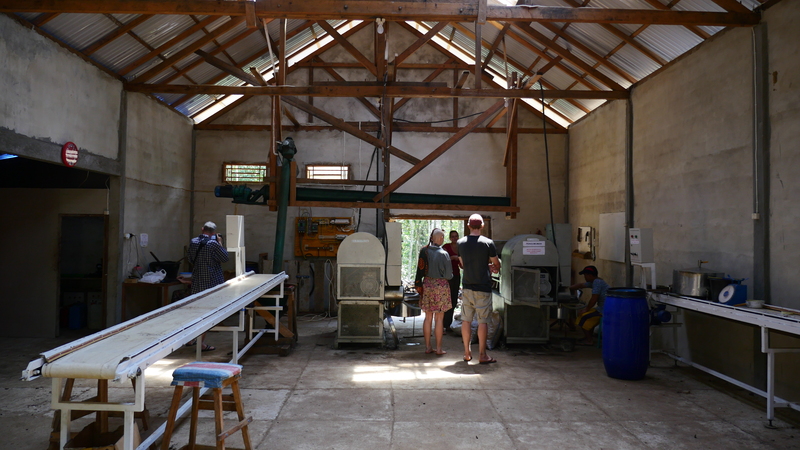 The villagers of Tembak were also proud to show us their fully operational zero-waste factory, designed by Dr Willie Smits, to process the nuts of the native tengkawang tree. 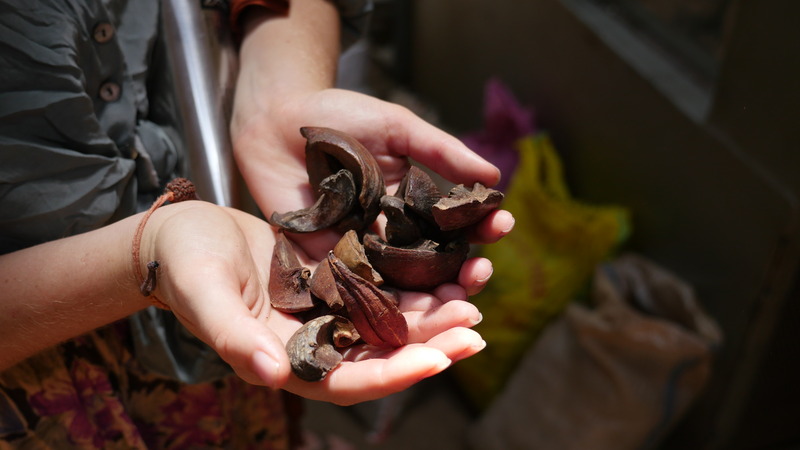 Tengkawang trees grow in abundance amongst the rainforests surrounding the village and each year the trees drop large nuts to the forest floor. 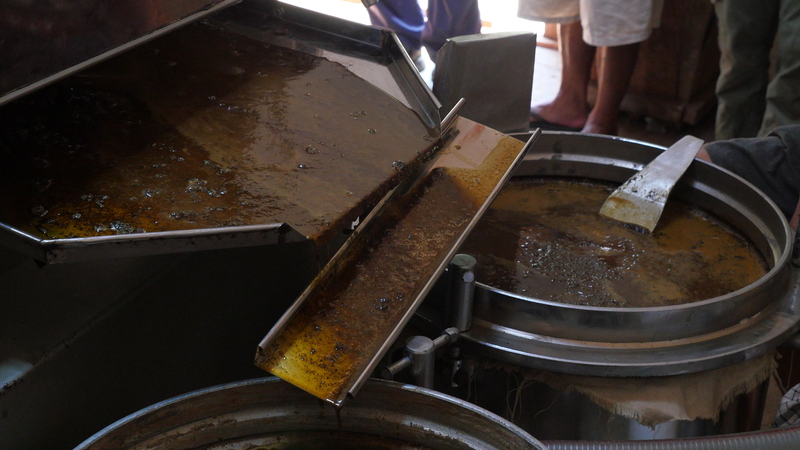 The tengkawang nuts are being collected and pressed in this factory to extract the nutrient rich healthy oils and fats. These oils can be used for cooking and in the production of cosmetics and biofuel. Any bi-products of the process are used for chicken and fish feed, leaving absolutely no waste behind. In only four months since the factory was completed the local people have produced nine tonnes of tengkawang oil, which they are not only using within their village, but have also begun to sell. I was overjoyed to learn of this 100% sustainable and ingenious method of providing an income to the local people from the rainforest. Tembak continues to act as a model for other villages who do not wish to give in to the short term financial enticements from the destructive logging and palm oil industries. Solutions do exist and the people of Tembak are at the forefront of living sustainably and protecting their forests and wildlife. 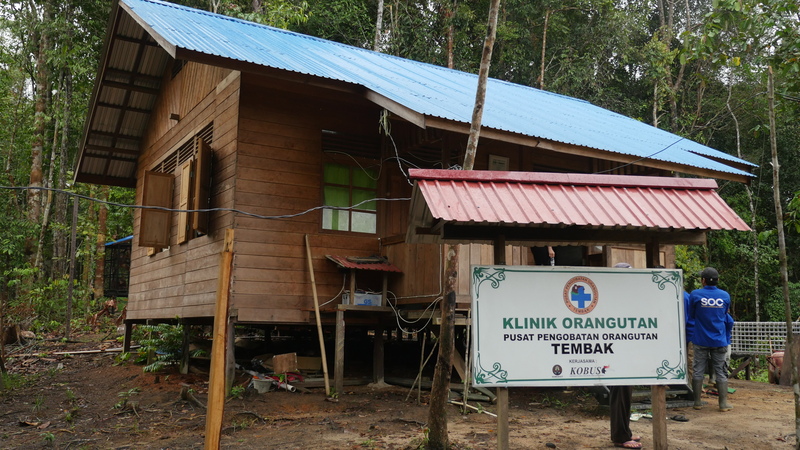 Plans are now underway to construct a ‘green school’ in Tembak, using funds raised from supporters of the project and a very generous donation of $10,000 from one woman who was moved to action by the movie. This high school will mirror the sustainable green school in Bali and provide secondary education to students from the village of Tembak and surrounding areas. It is hard to believe how much has been achieved by the amazing local people in such a short amount of time. They are truly inspiring ‘eco-warriors’ fighting for the protection of their forests and the futures of their children. I believe that it is our responsibility to continue supporting them, by providing the funds essential to realizing our shared goal of providing viable alternatives to palm oil to save the remaining rainforest and wildlife of Borneo.